If you are new to cryptocurrencies the vast array of new vocabulary which you need to learn can seem overwhelming. To combat that, today we are going to be covering what a Paper Wallet is and how you can make your own. A Paper Wallet is a cryptocurrency wallet which is printed onto a piece of paper and thus has never been live. This means that the wallet has never been imported into a wallet such as Daedalus or Yoroi, which is connected to the internet, and thus it is considered as a form of cold storage. This is much safer as the risk of a hacker being able to physically acquire the piece of paper you print out is nil, while the chance of them being able to steal your private keys from your hot wallet on your computer is actually above zero. This obviously still leaves the option of a burglar physically stealing your paper wallet, however this is still much safer, especially if you take extra precaution with the physical storage of your paper wallet. As such many people opt to use paper wallets for storing their coins long-term, especially if hardware wallets are not available. So then I’m sure you’re wondering, how does one make a Cardano Paper Wallet? For the rest of the post I’ll take you step by step in creating your own. 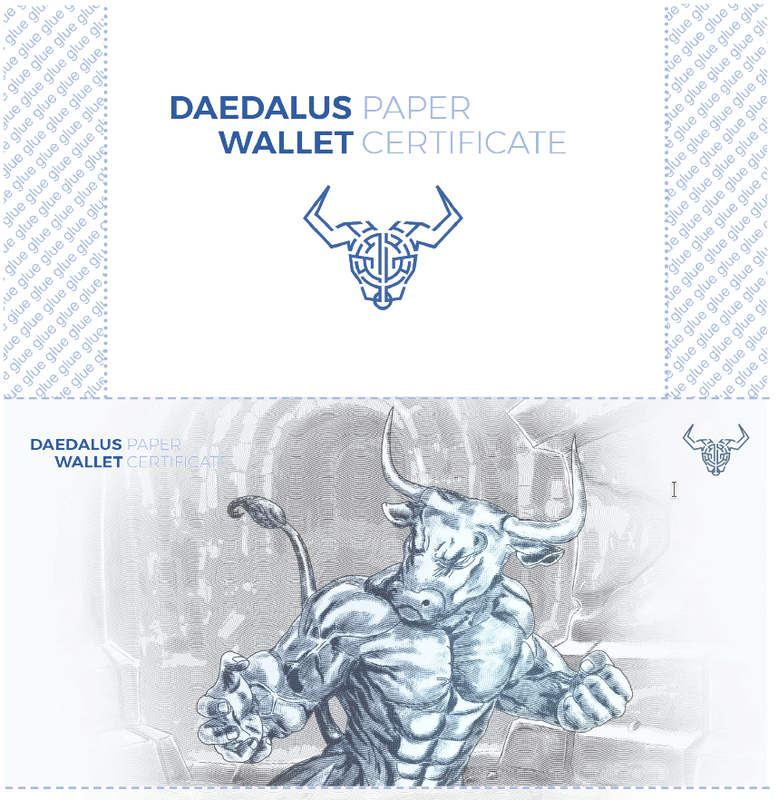 First thing’s first, you need to have the Daedalus Wallet installed. This is the official full node wallet developed by IOHK which supports the creation of Paper Wallets. Once installed, Daedalus will sync the entire Cardano blockchain which may take some time depending on your computer and internet speed. You will then be brought to the “Complete Your Certificate” screen as shown. 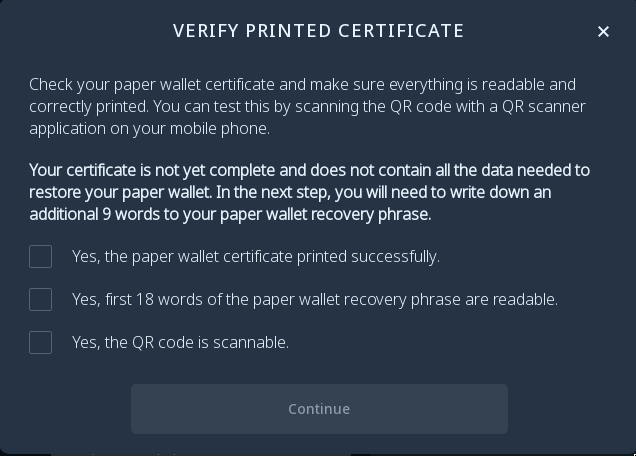 Make sure you copy down these 9 words onto your Paper Wallet by hand and double check to see that what you wrote is readable and correct. 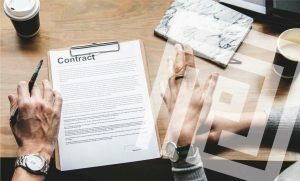 Though this may seem like a hassle, this is a security feature so that even if someone were to acquire the pdf which you originally printed out, they would still be missing the final 9 words which you wrote in by hand. 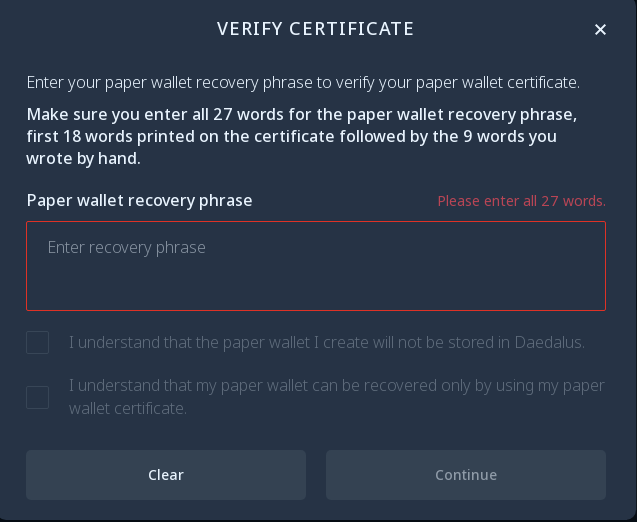 Then the “Verify Certificate” screen will pop up where you need to enter all of the 27 recovery words from your Paper Wallet to verify that you have copied them down correctly. Once you have continued, the finish screen will pop-up. 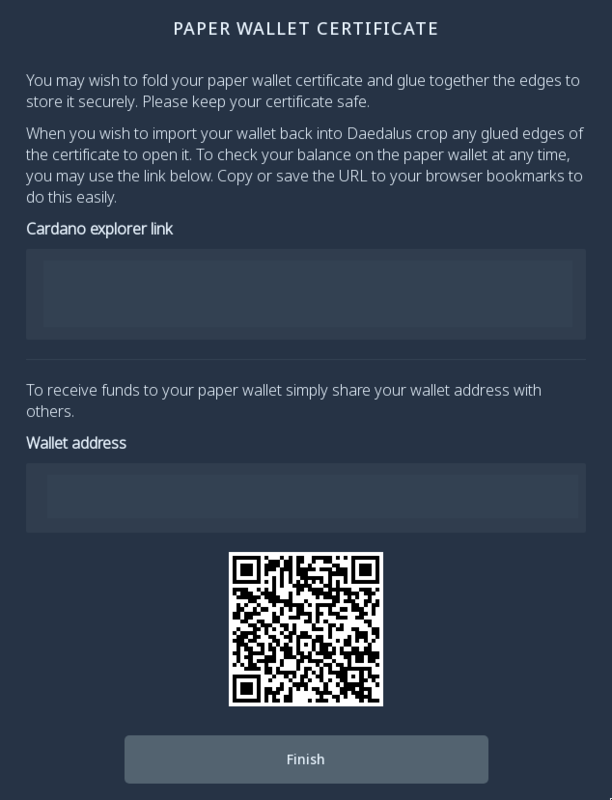 Here you will find a link to check the balance of your paper wallet (may be a good idea to bookmark this link especially if you are not too tech-savy), the public address of your wallet, and a QR code of the address as well. When you are done proceed and click “Finish”. 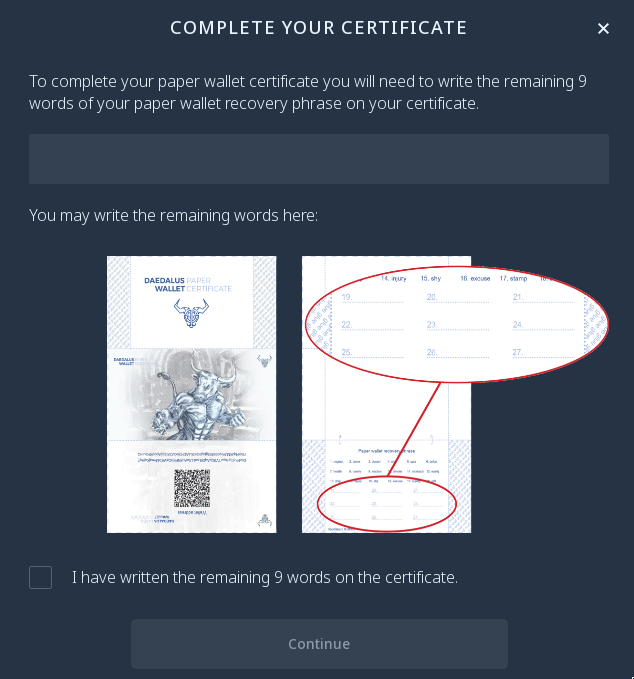 There you have it, you have finished creating your Paper Wallet! If you wish to deposit ada to the wallet simply send it to the wallet address shown on the final screen or use the QR code. (both of which are also printed onto your Paper Wallet too) Alternatively you can also use a free app like Papware to scan the QR-code and keep the public address saved on your smartphone. This lets you keep track of your balance at the tap of a button while keeping all of the benefits of using a Paper Wallet. 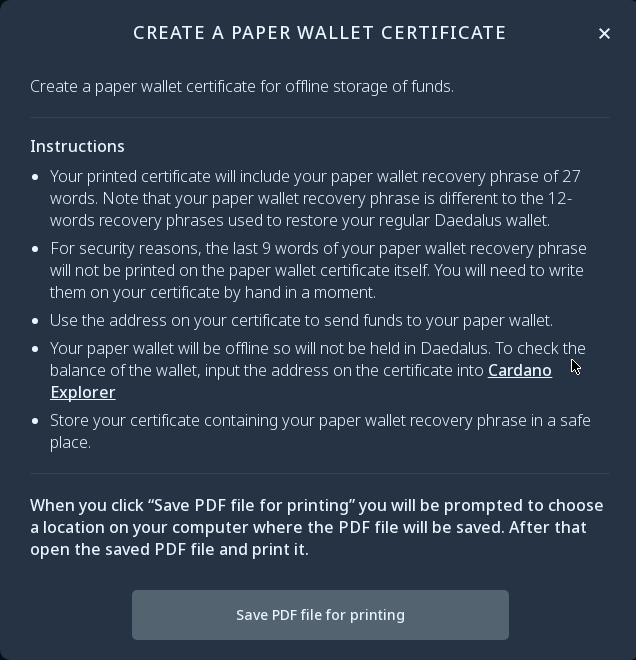 If you ever wish to withdraw from the Paper Wallet you must import the wallet back into Daedalus using your secret 27 word phrase. This will give you full access to your funds to do whatever you wish with them. However, do remember this then makes your wallet “hot” again. If you wish to “cold” store your ada once more after withdrawing from the wallet, then you will have to proceed in creating a new Paper Wallet using the same process again and depositing your remaining ada into the new address.